Today’s 6-3 Supreme Court ruling in King v. Burwell means that health insurance subsidies under the Patient Protection and Affordable Care Act can and will continue, and it’s an understatement to say that that’s wonderful news. A few months ago, social media was abuzz with Angelina Jolie-Pitt’s op-ed piece in The New York Times about her decision to have her ovaries and fallopian tubes removed in a second round of preventative surgery. What Happened to the Public Option? Dear Fellow Democrats, Let me start out by claiming my naivety. As any viewer of Fox News will tell you, America has become an entitlement nation. This claim is reinforced by example after example of individuals gaming the system or dissected across Fox’s political theater. The right’s fixation on the poor has become so blatant Fox has even come up with a pseudo-correspondent that fuels the misleading perception. Jason Greenslate, or “Food Stamp Surfer”, has been remarkably effective reinforcing the narrative of widespread welfare abuse. In fact, he was even mentioned by Representative Tim Huelskamp (R) on the House floor before a taking a food stamp vote, "You can no longer sit on your couch or ride a surfboard like Jason in California and expect the federal taxpayer to feed you." Hmmm. I’m guessing Representative Huelskamp missed the irony. The Republican grab bag of anecdotal examples is very effective in creating a “poor are lazy” perception. To many on the right, those who take advantage of entitlements or welfare services are parasitic or morally deviant. This unabashed stereotype is important when justifying their political ideology: Democrats want everyone to live off the government, Republicans want individuals to succeed driven by personal motivation which handouts undermine. The problem with such logic is demographics paint an entirely different picture of welfare recipients. Did you know that half of food stamp expenditures benefit children? Or that one in five veterans take advantage of the program? Did you know that food stamps represent a minuscule 1.8% of our federal budget or that food stamp fraud accounts for less than 5% of the total program? 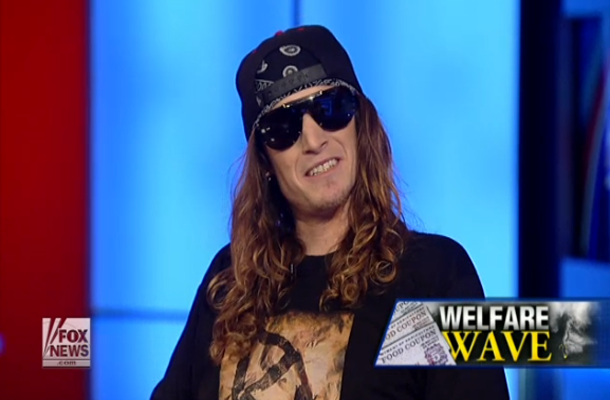 Such information might change the perception of voters about the role of government which is why “Food Stamp Surfer” becomes the poster child of the Fox News repertoire. Collective data is not personal and unpersuasive. You might not know any of the millions of children and veterans that are supported by welfare but you do know your aunt’s best friend’s sister is sporting a $500 iPhone paid for by the government. GOP: Dear Kids, 50% of all food stamps go to you. Work harder and stop being moochers. Misinformation about our Nation’s entitlement programs (Welfare, Medicare, and Social Security) is equally exaggerated. Even the word “entitlement” conjures negative connotation driven by ignorance and misunderstanding. 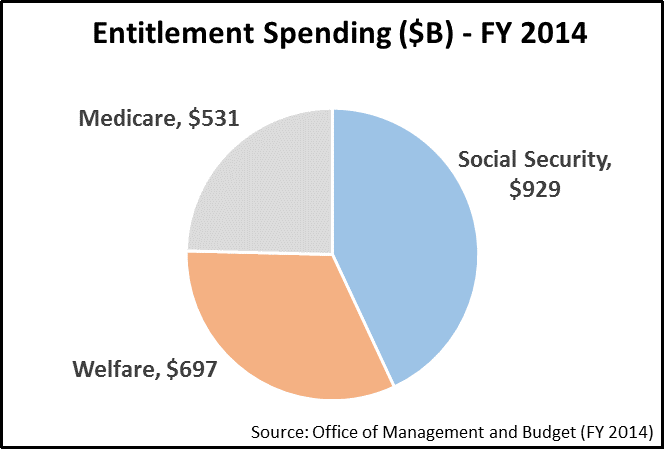 Many Conservatives are enraged that we spend 57% of our federal budget on entitlement programs without any consideration to the demographics. Over half of all entitlement dollars are spent on the elderly. Another 20% are spent on the disabled. 18% are spent on the working poor like Walmart employees. In fact, almost $1,000 annually is spent per employee offsetting Walmart’s benefit liability. You shouldn't be thanking Walmart for low prices, Walmart should be thanking you. So what of the remaining 9% able-bodied freeloaders drawing entitlements? Let’s hang them. I’ll get the tar, you get the feathers. But let's be careful, in our haste to enact fairness and justice we might be punishing a demographic that has equal need for taxpayer’s help. There are thousands of students that are attending colleges and universities while trying to support families. Many are studying for high earning careers as dentists and doctors, easily returning the entitlements being invested today. Even if we do conclude the 9% are actual moochers like Jason Greenslate, we should still resist the urge to throw the baby out with the surfer. Even President Obama’s signature legislation, Obamacare, is deficit neutral (CBO) offset by mandates and penalties with no impact to our deficit. Where our anger should be directed is government’s inaction, as the last major change to entitlements was the 2003 Prescription Drug bill. We should be holding the House of Representatives accountable, since the Constitution dictates laws originate in the lower chamber, to generate common sense bipartisan solutions. But herein lies the problem for the GOP-led House. Any changes to entitlement programs that do not include Medicare and Social Security reform are a wasted effort and any successful change will anger core constituents. Trying to repeal Obamacare 50 different times is a much safer play for House members interested in keeping their jobs through the next election cycle. Even if undermining entitlements fosters partisan opportunities our problems are not disappearing anytime soon. I’m sure my Libertarian friends would suggest a free-market solution. Remember when Medicare was passed in 1965? 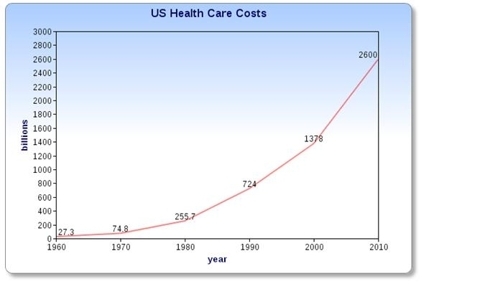 Only half of our nation’s elderly had healthcare and costs associated with medicine were skyrocketing. The Sixties’ free-market solution was basically a Darwin-driven model. Can you imagine being a 55 year old senior looking for healthcare coverage after being dropped by your company’s insurer upon retirement? How about charities? Can they fill the void? Based off of IRS data charitable giving (currently $300B) would need to increase three-fold to cover current liabilities. This also assumes every donation dollar is appropriated against entitlements; not building churches, saving rhinoceroses in Africa, or giving to one of Karl Rove’s SuperPACs. Regardless of any proposed solution the very first step in delivering lasting reform is awareness. Data has become the newest inappropriate four-letter word being replaced with trivial anecdotal examples. But I get it, fully understanding issues takes effort and who wants to waste their time when partisan blogs are like crack to drug addicts (just slap "liberal" on this post so the right can disparage the content). We need to avoid assuming our best-friend’s cousin scheming the welfare system is representative of millions of Americans looking for help. As Jon Stewart said recently, stop looking for the elusive “Welfare Bigfoot”. Start looking across the street, recognizing that single mother struggling to provide for her child, and be thankful we are in a much better place. Once we understand who it is we are helping, the solutions will become more clear. 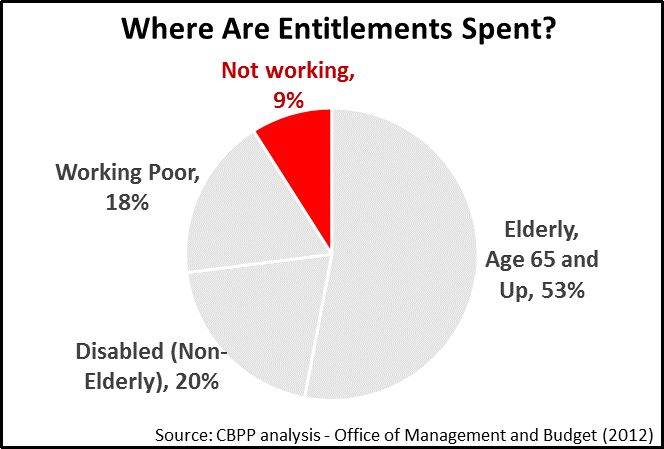 When the GOP says entitlements are for the lazy, they are talking about seniors and the disabled where 73% of our entitlement spending goes. Interested in what our government spends? Here are the topline 2014 Total and Welfare budgets. Imagine you work for a large company that pays an acceptable salary. Like three-fifths of all American workers, your employer also pays a significant portion of your family’s health insurance premium, which, as part of a group health insurance plan, already costs much less compared to the health plans available to small businesses and the self-employed. 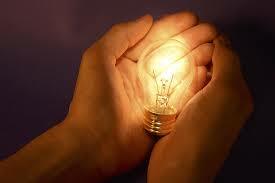 However, after working at the same company for many years, you yearn for the opportunity to start your own business. Maybe you are tired of being subordinate to a large corporate bureaucracy. Perhaps you have even begun to hate your job. Over time, you develop a several good business ideas and finally are at a point where you feel your proposals are robust enough to start a new business. What would keep you from quitting a job you do not like for pursuing your personal business dream? Like any responsible breadwinner, if the job was your family’s sole source of health insurance coverage, you would likely be hesitant to give that up in order to start a new business without any guarantee of success. Is Obamacare Doomed for Failure? When the media finds a narrative it loves, it tends to hang on, even when the facts do not compute. The poll numbers for the Affordable Care Act (ACA), or Obamacare, have plummeted since the embarrassingly flawed roll-out of the online health insurance exchanges, and as reports spread regarding cancellations of some lower-grade insurance policies. And while some of the recent criticism of the health law is appropriate and much of the damage self-inflicted, polls also show that most Americans know very little about the health reform law. “Health Affairs,” a leading peer-reviewed journal on health policy, recently conducted a survey of top health care executives from large hospitals and health care systems across the U.S. and found surprisingly positive viewpoints about the prospects for ACA’s success. It is noteworthy that the individuals polled for this survey are health policy leaders who are well informed on how care is delivered and health care budgets are managed. Of those surveyed 65 percent believe that the U.S. healthcare system will be somewhat or significantly better than it is today by 2020. When asked about the prospects for improvements in their own organizations, 93 percent predict that the quality of care will improve. Similar attitudes were forecasted for reductions in cost and improvement in delivery of care all around. The current shutdown of the federal government and upcoming showdown over the debt ceiling has caused many people to ask who is to blame for this gridlock. The media, in its effort to try to report both sides of the story, often end up giving balanced treatment to an unbalanced phenomenon. What we have is an extremist element within the minority political party that refuses to accept the results of the previous elections. Leading up to the shutdown, House Republicans demanded defunding of the Affordable Care Act (or Obamacare) in exchange for passing a continuing resolution budget that would fund the rest of the federal government for a brief period. Republicans also threatened to prevent the debt ceiling from being raised that could result in a catastrophic default on our national debt if their demands are not met. In making these demands, Republicans are attempting to thwart the Constitutional order of our government while threatening financial and economic chaos. Obamacare pales in compari son to the importance of freeing the Slaves. And shutting down the government is nothing at all like Civil War. But the principles are exactly the same. 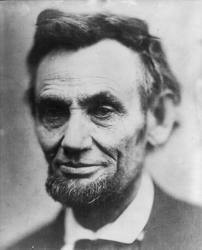 President Obama came in inexperienced and made mistakes - so did President Lincoln. But they both promoted the overriding principle of Constitutional government of, by, and for the People - all of us People - not any particular faction, party, or philosophy, except for this: The Constitution is not some stale, old parchment perpetually framed in the National Archives and in the context of the 1700s. No, there is relevance today for the principles that "all men are created equal, that they are endowed by their Creator with certain unalienable rights, that among these are Life, Liberty, and the Pursuit of Happiness." All our individual ideals and aspirations have value as we learn to work together within the framework for government that our Founders were inspired to construct. And those principles should last for the eternities. In 2009 when President Obama first took office, America faced a serious healthcare problem that had been ignored for decades. Significant changes needed to be made to address our nation’s problems, which included rising costs and inadequate care following a trajectory to insolvency. At President Obama’s inauguration forty-five million citizens did not have access to insurance, using the emergency room as their primary care facility. Medicare and Medicaid were facing default and driving federal deficits to record levels. The private healthcare industry accounted for 21 percent of total US GDP, contrasting with 11-13 percent for comparative nations. In addition, the US healthcare budget faced $60 trillion in unfunded liabilities over the next 75 years, with no solution. To compound the problem, private industry was leveraging tax-payer dollars for short term profits, disregarding long term accountability. At first glance the challenge to obtain healthcare solvency appeared insurmountable. Many demanded scaling back Medicaid, while others wanted to implement similar single-payer programs as found in Germany, Japan, Canada, or England. Several blamed insurance and pharmaceutical industries for driving costs, and others cited frivolous lawsuits which drove doctors to provide unnecessary care. Almost all voices aligned that cutting Medicare was not an option due to voter demographics, and any legislation to weaken private industry would be met with cries of socialism. It was under these conditions that the Affordable Care Act (ACA) was debated and passed which brought together ideas from every political ideology. Business: Shifts healthcare responsibility away from the government to private industry. Individual: Levels the playing field between private healthcare providers through the use of exchanges, thereby fostering competition for individual policies. Government: Expands state Medicaid to cover families under 133 percent of the poverty line (Medicaid currently covers up to 100 percent). Large corporations with elastic goods depend on low cost structures and therefore low wages. In many regards these businesses are as dependent as the lazy, using government to subsidize their benefits and pocketing the difference. Almost half of the uninsured (46%) work full time with 28% working part time. Many of these full time workers are employed by companies like Wal-Mart, whose average associate receives $1,000 in annual government entitlements. Subsidizing benefits with governmental entitlements has allowed corporations and shareholders to enjoy record profits. They also place greater pressure on government liabilities and drive up costs to taxpayers. Obamacare (ACA) holds all businesses and corporations responsible for supplying healthcare. If a business employs more than 50 full time workers, they are responsible for providing insurance or paying a penalty (the implementation of this mandate was recently postponed for a year). If a company employs 25 people or less, tax credits are provided to subsidize coverage. Seventy percent of all healthcare costs happen in the final fifteen years of an individual’s life, typically while under the umbrella of Medicare. Access to life-long preventative medicine is critical in lowering Medicare liabilities. Shifting coverage to private industry also lowers the government’s emergency room expenses which the uninsured use in place of primary care physicians. 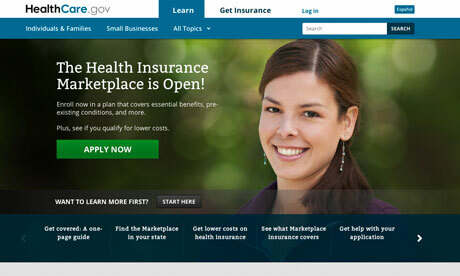 There has been significant reaction to the healthcare law’s corporate directive. Mandating industry to provide insurance for their employees will increase costs for any entity not already doing so today. This is a fair criticism, especially when it comes to small businesses that cross the fifty employee threshold. However, looking at cumulative data and avoiding anecdotal arguments allows for a balanced discussion of the overall impact. When it comes to small business, less than ten percent fall into that much-discussed mandated responsibility, as the other ninety percent currently meet Obamacare (ACA) requirements. To assist both the ten percent and the 90 percent, Obamacare gives access to competitive exchanges (known as SHOP) which will drive down costs for employers currently offering healthcare. When an individual is not covered by an employer or as a dependent, they are responsible for their own insurance. Beginning in October 2013, the government will create a competitive vehicle where insurance companies meeting basic requirements can compete for business. Similar to websites Expedia or Lending Tree, once personal criteria is entered, insurers will publish rates and the consumer can choose a plan based on price or benefits. Known as insurance exchanges, these will be launched nationally to help consumers make educated choices and provide a baseline for coverage comparison. Exchanges will soften interstate requirements and prerequisites allowing for productive competition between insurance providers. Similar to existing employer-provided healthcare, a person's individual policy will also allow access to preventative medicine. Even more important, individual healthcare will allow small firms (fewer than fifty employees) to compete with the benefits of larger firms when attracting employees as benefits are universally. Since the bulk of uninsured individuals are under 35 years (65%), providing coverage for them is critical to lowering costs for all private insurance companies, given their healthy age demographic. These younger, healthier participants are needed to offset high risk individuals, much like auto insurance or Medicare. Because the inclusion of low risk individuals is critical in driving down costs, it is imperative they sign up. One of the concerns is that uninsured individuals will forgo purchasing their insurance until they need it. At this point, the only penalty they will face is an $89 annual tax, which is not very persuasive. However, if the exchanges are able to drive down prices making health insurance affordable and attractive, this concern should be overcome (we will know in October). On the government side, Obamacare (ACA) legislation mandated that State Medicaid programs cover individuals whose annual earnings fell within 133 percent of the Federal Poverty Level (FPL). The FPL currently covers at 100 percent, so the ACA provided funding to cover the increase; however, this mandate was struck down by the Supreme Court. States can now opt out of expanding Medicaid, forgoing federal subsidies and leaving millions of their state residents uninsured. Since those in this demographic tend to be part of the healthier population, the aforementioned balance between the healthier individuals providing offset to sicker individuals will be more difficult to obtain, and insurance prices may not reach their full potential. Living in Arizona and watching the fight over Governor Brewer’s decision to expand Medicaid, it’s hard to understand why any state would opt out. The expansion will bring additional funding, jobs, and access to healthcare. States rejecting the Medicaid expansion will lose out on $8.4 billion in federal funding, exclude coverage for 3.6 million uninsured, and see $1 billion more in uncompensated spending. Even more problematic, states rejecting expansion will see non-reimbursable emergency room and Medicare costs grow. While I have argued that healthcare coverage is a three-pronged responsibility, many feel that a single payer healthcare system is the preferred model. This caused some to level the charge that President Obama did not fulfill one of his signature promises from the 2008 campaign: obtaining single payer healthcare. Instead he took Governor Romney’s framework from Massachusetts, authored by the conservative Heritage Foundation, and leveraged the plan in a spirit of compromise. Initially this infuriated supporters as they felt betrayed on an issue they believed was mandated from the decisive election victory. While President Obama may have expected this, what he probably didn’t expect was the venomous backlash from the right, even though the ACA is based on a healthcare plan they helped create, implemented by a popular centrist Governor. Perhaps what opponents are politically afraid of is not the demise of the American healthcare system, but the potential success of Obamacare (ACA). Currently three states have released preliminary pricing for their healthcare exchanges with better-than-anticipated results. By October all states will see competitive pricing on the exchanges and citizens across the US will begin shopping for their preferred rates and cutting through political propaganda. For the governors of states that rejected the expansion of Medicaid, they will have to explain to 3.6 million employed voters why similar citizens in other states have healthcare and they do not. Pre-existing conditions will not be a barrier to coverage. Preventative medicine will be included by every approved insurer saving billions of dollars on Medicare. A defined percentage of insurance revenue must be applied to the actual care. Parents can keep their dependent kids on their insurance until the age of 26. Insurers cannot drop coverage due to personal changes in healthcare. Doctors will be paid with Medicare rates, currently higher than Medicaid rates. The “lifetime cap” for individual reimbursements is removed. Perhaps the biggest criticism is the expense of the Affordable Care Act (ACA). But according to the non-partisan CBO, Obamacare (ACA) is deficit neutral. If Obamacare was to be repealed, there would be no change to our annual deficit or national debt. Any additional costs associated with the law are offset primarily by scale and penalties paid by those unwilling to buy private insurance. In fact the latest projections by the CBO resulted in $150 billion budgetary savings over 10 years versus the system currently in place. Opponents also charge that Obamacare is a tax for those who remain uninsured. This is a fair statement; however the receipts collected will help offset emergency room liability for the uninsured that all taxpayers subsidize today. 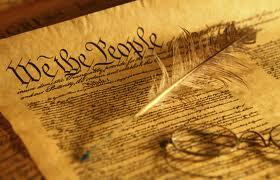 To understand the new healthcare law, it is imperative to ask the right questions in order to open up honest debate. Obamacare (ACA) is a far cry from socialism; its main purpose is to reduce Medicare and uninsured emergency room expenditures through access to care. It uses tax penalties to push citizens away from government and into the hands of private insurance companies. Obamacare (ACA) also delivers improved quality of life due to access to health care, unattainable for most Americans due to cost -- a significant benefit to society. 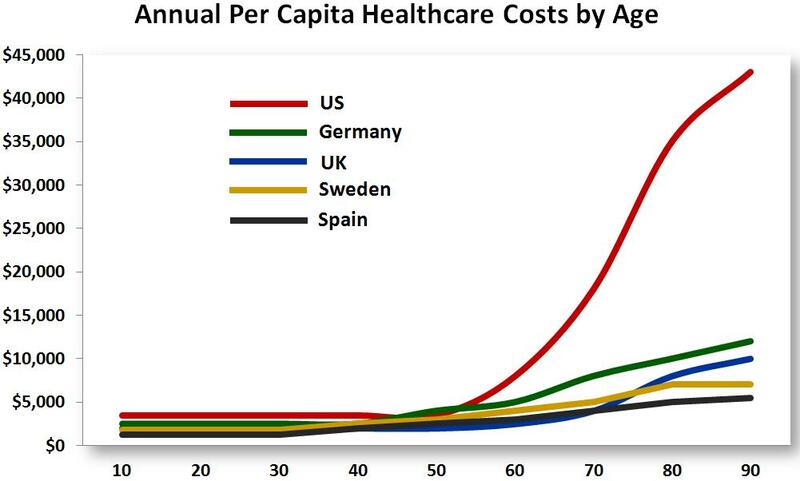 Finally the most compelling argument for the ACA is our inability to call the United States the greatest country when our healthcare expenditures are the highest in the world and millions of our citizens lack basic insurance coverage. The Affordable Care Act still needs revision, but it is a much needed improvement over the previous status quo. Thanks to Elizabeth Eastmond for her edits. MormonPress is not an official organization of The Church of Jesus Christ of Latter-day Saints.